10 (or 5 linked pairs) chorizo sausages, approximately 1-1/4 lb. Preheat oven to 300 degrees F. Finely chop the onion, garlic, and chile. Heat the oil in a large oven-safe pan (with a lid) or cast-iron or enameled Dutch oven and fry the onion, garlic, and chile until soft, on low for about 10 minutes. Add the cardamom seeds, cumin, coriander, cinnamon, and red pepper flakes. Stir the onion spiced mixture together and then add the chorizo, sliced into 1/4 inch coins. Drop in the cubes of beef, turning them in the pan with the chorizo and onion mix, to brown the meat. Stir in the tomato paste, ketchup, drained kidney beans and diced tomatoes. Add the water and bring the chili to a boil. Once bubbling, sprinkle the chocolate chips over the chili and give it a good stir. Put on the lid and transfer to the oven. Cook at this low heat for three hours. 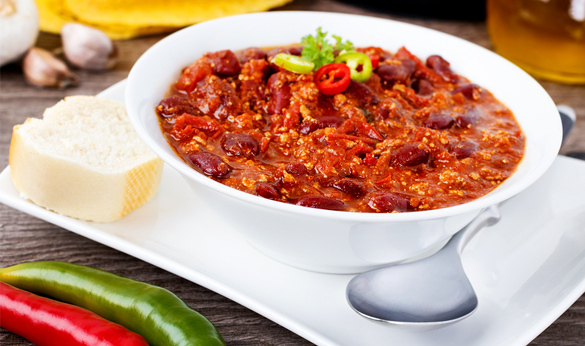 Once your chocolate chip chili is cooked, it is best when left overnight to improve the flavor.